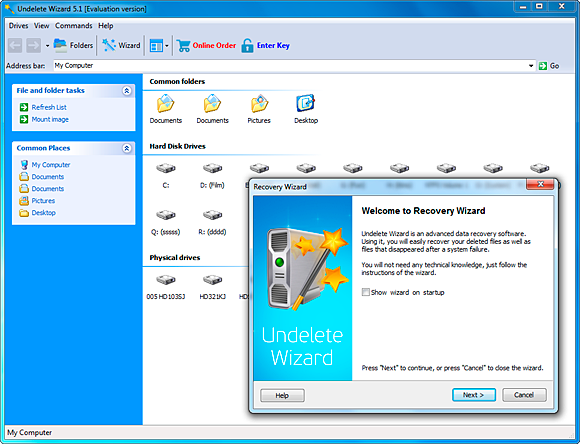 Undelete Wizard recovers deleted and lost files quickly and reliably in a few easy steps! You can preview deleted files with the free version of Undelete Wizard. The Live Preview feature shows you the content of deleted documents and pictures the way they were intended to be viewed. No crippled HEX previews that make it difficult to judge the health of the file! You’ll see a Word documents as it’d show up in Microsoft Word, and a picture as it would appear in an image viewer. If you can view a deleted file, Undelete Wizard can guarantee the recovery. Empty or disabled Recycle Bin? Deleted files a while ago? Can’t download files from a flash memory card? Undelete Wizard recovers deleted and inaccessible files quickly and reliably in a few easy steps! Undelete Wizard makes it simple to choose files to preview or to recover. Featuring the convenient Explorer-like interface, the tool presents Windows users a familiar experience, making even new users feel immediately at home. Designed to be completely accessible and easily usable, Undelete Wizard features a convenient, step-by-step user interface that makes file recovery extremely simple. Simply run Undelete Wizard and choose a disk to begin. Wait a few moments, choose files to undelete from an Explorer-like window, and click Finish to complete the recovery. It is really that easy! Undelete Wizard is not just easy to use, but features sophisticated technologies to ensure the best results. The PowerSearch technology integrates years of research, enabling surefooted recovery under the most difficult circumstances. The innovative data recovery technology scans both the file system the hard drive in order to locate deleted files that are no longer shown in the file system. If the file system is corrupted or unavailable, as in a re-formatted hard drive, PowerSearch is the only technology that is still able to locate and recover certain types of documents. By using a wide and growing list of signatures to detect files such as Microsoft Office documents, various digital pictures, ZIP and RAR archives, music and video files, PowerSearch makes it possible to locate and undelete files that were deleted ages ago. If you are working on a healthy hard drive, PowerSearch matches file system records to the real contents of your hard disk, presenting the most complete list of recoverable documents. The PowerSearch technology allows Undelete Wizard to recover deleted documents in various formats. Microsoft Office files such as RTF, Word DOC and DOCX, Excel XLS and XLSX, PowerPoint PPT and many more; Adobe PDF, PageMaker and so on, over 50 different office formats in total. You can lose a bunch of digital pictures at once shall a flash memory card go bad. Recover digital images quickly and easily! Undelete Wizard scans the entire flash card block after block, locating and recovering every photo thanks to the PowerSearch technology. JPG, GIF, BMP, PNG, TIFF, RAW, DNG, CR2, NEF and many more digital picture and RAW file formats are supported. Deleted ZIP and RAR archives can contain multiple files, often making their recovery a top priority. Undelete Wizard locates and recovers the deleted archives with the PowerSearch technology. Unlike free undelete software, Undelete Wizard can locate and recover files in various difficult situations. Deleted a file long ago? The PowerSearch technology can find the file on the hard disk by scanning the disk’s entire surface. Reformatted a disk? Undelete Wizard will locate and undelete all recoverable files. Damaged or corrupted flash memory card? Undelete Wizard retrieves digital pictures from corrupted cards quickly and automatically.